This entry was posted in Uncategorized on January 19, 2016 by Gary. we may have to wait on that break for at least 1 month if the ECB decides to increase its QE on Thursday (a quite likely but non-tradable event until it becomes fact). – now stocks are strongly while ignoring dismal Chinese macro reports from yesterday. Upbeat-PM-and-downbeat-dollar talk is jumping the gun with a high probability ECB action and with such a streak of opposite signals from the Market. On the other hand, if the ECB does NOTHING, then I will personally go long gold too on Thursday as USX will fall into IC decline – but now that seems unlikely. I dont know Gman, gold is crap and miners still stink to high heaven. Even permabulls at Sprott say 2016 will stink for metals prices as they go sideways at best, though they do recommend buying select miners into weakness for maybe 30% gains. I’m not sure why they would suggest getting involved in a sector that routinely loses 50% when the best upside scenario they see is some names rising 30% before pulling back. I’ll sit on the sidelines and wait to buy the S&P after a 20% correction instead. It’s a sure bet as long as the Fed can print money unfettered. At this point all I’m expecting is another bear market rally out of gold. I don’t think the Boyz are done with it yet. Stops hit on NUGT… Oh well! ? Be glad you got out. I was surprised GDX fell today, have to say. well the end of the world for today’s open just didn’t happen much to the disappointed of the pornbears as expected. All hinges on OIL, gold is irrelevant at this point as it has been for years yet many on this site led by gold keep flogging the same dead horse. Missing the forest for the trees and not learning anything from it. Oil needs to turn, and the Iran dump of oil on flooded markets is largely discounted. A pop up in oil will let the market rise and dollar to drop at least for a decent short covering rally. wow…just wow. 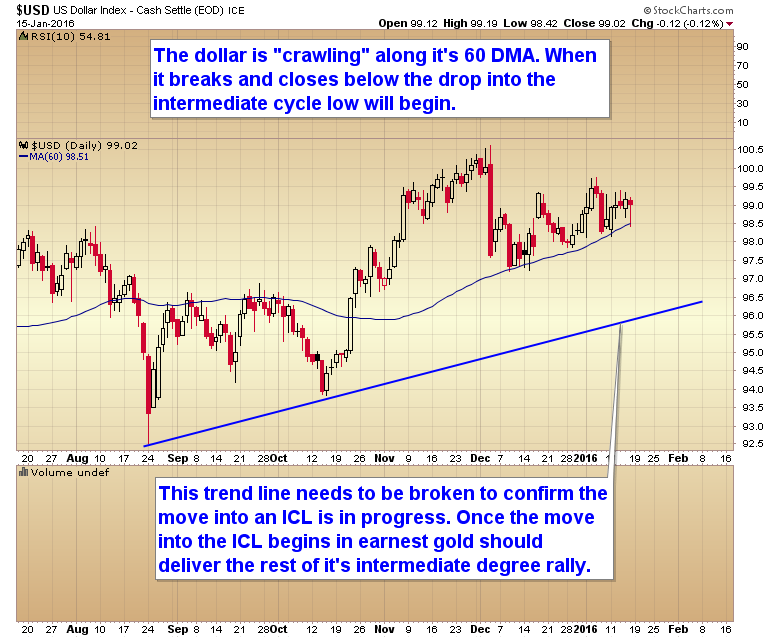 The miners are being slaughtered, and gold is barely down; silver is up! Looks like a final bloodbath phase has begun for miners. They usually last 5-7 days. Once this is over we may have a final bear market low. SIL is 6 days into it’s bloodbath phase. That being said I expect this will continue into next week. We need the next leg down in stocks to begin. Once it does and there is no longer any doubt that the only option left is for the Fed to start QE 4 to stop the crash in stocks then the dollar will top and the metals will bottom. Right now the market is still hanging onto the idea that stocks may have formed a double bottom. That hope needs to be crushed by another sharp move down. If the HUI bottoms around 75 and is not the bear market low, then there are other forces at play. There should not be another low after this. Look back at the divergence between gold and HUI from 2008. More specifically, gold doubled and HUI extended less than 40%. Now the miners are almost opposite of oil. The energy stocks are trading a high premiums to the price of oil indicating either oil is going to rally sharply or energy stocks will decline sharply. This is always the sentiment during bloodbath phases. It will get more intense as the week goes along. But once it’s over we should have an exceptionally powrful rally in the sector. Code red: HUI weekly is breaking down! even Sprott is not saying anymore to buy Miners ,they are scared to death as I am. I don’t know what to think,you said recently that you would have not sold the Miners now because it’s too late,Jeff Gundlach said something similar but the next target for HUi could be under 75,and there is no end in sight for this carnage. We have no final lows in sight,it’s insane. This is what bloodbath phases do. They make you think it will never end. If this is intense enough then we will get our final low. the problem is that I’ve had enough of bloodbath phases,it’s since 2011 that I’m swimming in a bloodbath , I hope not to drawn. I have listened to their interviews for informational purposes for years and I remember back to 2013 they continued to claim in 12-18 months would be a great bottom for the mining shares. I wonder if today they are saying the same thing? While miners r flushing out…GC_F/GLD showing relative strength and coiled for breakout to upside. This is a good article, and very much sums up my bias, that Gold has atleast bottomed for a 3 month rally into March, targetting 1150/1200. Unknown if lowers lows still ahead, but I suppose it’s possible to go below 1000. Looks like silver is bouncing off the bottom first. If it lasts more than a day we could on to something. Because the miners were resisting the decline and holding up better than the metals throughout December. It’s catch up time for the miners. Daily GDX looks like a huge H&S from last July till now. And so far today, on a closing basis, today made a new low, breaking the neckline of say 13. Head at 17, measures to 9. 1 hr SPY/QQQ/IWM charts show that we’re not making a lower low yet. Maybe a bounce soon? $HUI now below 100. Wasn’t 200 that long ago. The high was 638.59. Now 99.32. Cool meter! Thanks for posting. Sure looks like SPY/QQQ/DIA/IWM are bottoming here. But I’m not sure it’s tradable – we may just gently drift higher for 2 weeks though, like the 2nd half of Dec, before the next deep cut. So much laughable criminal intervention to keep this farce green when it should be crashing. Holding short for now. New lows for miners . Sprott international don’t have anymore the courage to suggest gold stocks for the long term,but just for trading. The analyst called Rambus thinks we are experienced a new leg of the bear market in miners,his HUI target : 54 !! If we don’t have THE low soon I think ,unfortunately, we have entered a new stage of market history,probably we have entered a global depression very similar to what Harry Dent have forcasted for a long time. I know that selling everything in this environment is probably insane,but I’m very tempted to do it. Hope is one of the worst human sentiment. Faith is one of the best human sentiment to what I think. This is the sentiment we see during final bloodbath phases. It should get more and more extreme as the week goes along. Look for a bottom next week and a big rally as all those shorts are forced to cover. Massive volume on NUGT again. Normal to low volume on GDX and GDXJ, SIL also normal volume. Not much of a bloodbath. More like a short attack. My Canadian miners are up again today. They tried a short attack on a few of them but buyers overwhelmed them and they gave up. I would agree, this looks like an attack on the miners over the last several days. If Canadians aren’t following then it’s specific to the US market. Unless they are pricing in another interest rate cut in Canada tomorrow and an even lower Canadian dollar? Not sure, but when the miners have tanked in the past my Canadian miners were sold off as well. Today they were strong. From the volume in NUGT it almost looks like Miners are being smashed so NUGT can be accumulated even cheaper. To me this looks like a possible change in trend. Also weak volume on DUST. This definitely does not look like the start of an new major plunge in miners. Mike- the bankers shorted…what nationality ..??? Given Gary’s scenario of more sell-off of miners into the next week, HUI “can” hit the lower bound of 90s given its weekly chart’s support channel. Stay watching and be diligent on your shorts!